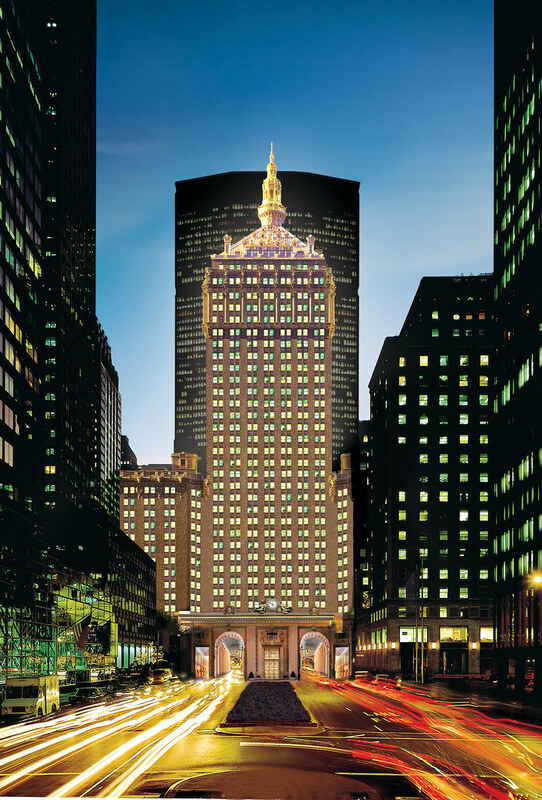 While the preservation experts at Beyer Blinder Belle are typically busy making old structures look new with new components that look old (like, say, the signage at a certain skyscraper), BBB’s designers also from time to time design from whole cloth. 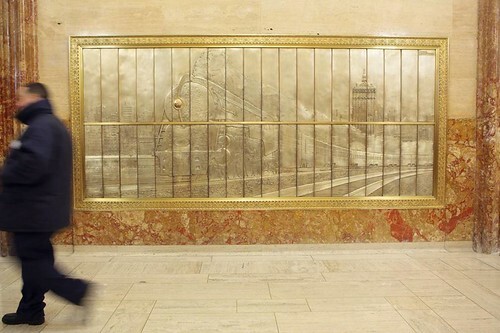 Or whole bronze, as is the case for a pair of murals created for a recent lobby renovation to 230Park Avenue, the former Helmsley Building that caps Grand Central. 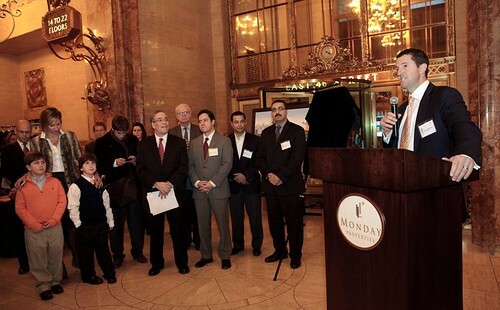 Last Monday, Monday Properties president Anthony Westreich, the building’s owner, dedicated the murals along with local pols Scott Stringer and Daniel Garodnick and Landmarks Preservation Commission chair Robert Tierney. 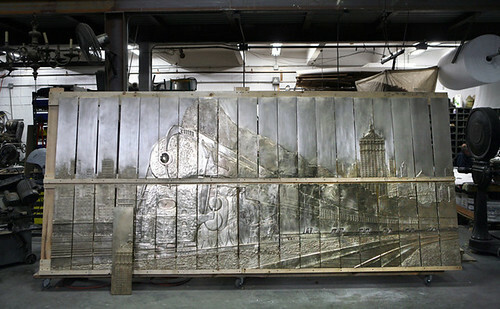 Weighing more than a ton, the murals—which were drawn by Chris Ludlow and sculpted by Joan Benefiel under the direction of BBB—hark back to the building’s history as the former headquarters for the New York Central Railroad, depicting a train speeding by with the distinctive profile of 230 Park in the background. See more photos from the dedication and shop after the jump. Westeich adresses the audience at the dedication in the newly renovated lobby. 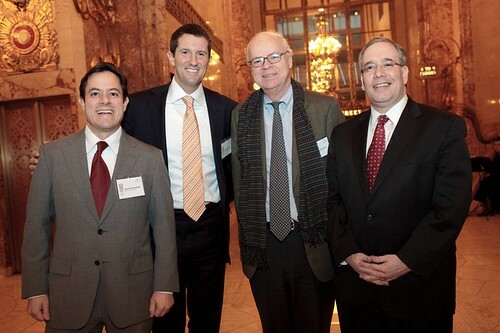 Garodnick, Westreich, Tierney, and Stringer at last Monday's dedication. 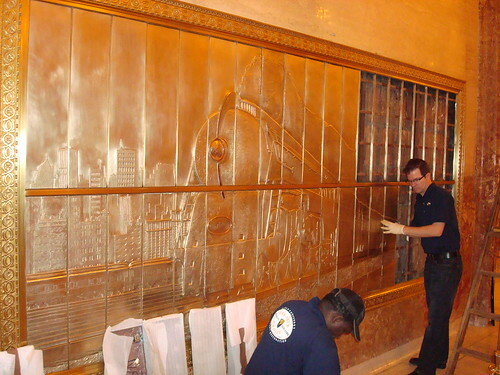 Workers installing the 40 panels that make up the mural.